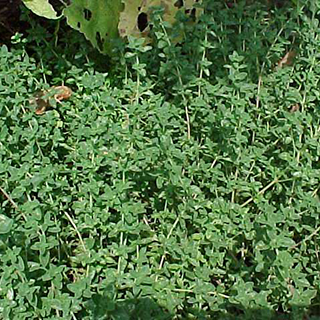 Originating from the dry, grassy areas of southern Europe, thyme is now widely grown worldwide as a culinary herb. It is is a good astringent mainly used as an expectorant and active antiseptic for the lungs to clear productive coughs, bronchitis and infections, while the essential oil is used in aromatherapy. Research in the 1990s also suggested antioxidant and anti-aging properties. Drink 1 cup (2 tsp herb per cup boiling water) 3 times daily for colds, chest infections, mild asthma, hayfever, stomach chills, or irritable bowel syndrome. Add 1lb (450g) of honey to 1 pint (600ml) of strained infusion (above) to make a syrup for coughs and chest infections. Take in 1 tsp (5ml) doses as needed. Use 1 cup of above infusion morning and night for gum disease and sore throats. Use 10 drops of thyme oil in 5 tsp (25ml) of almond oil as a chest rub for bronchitis and infections. Use with an equal amount of lavender oil for rheumatic pains and strained muscles. 20 drops (1ml) of thyme oil in 2fl oz (60ml) of water and use for insect bites and infected wounds. As a culinary spice, the fresh or dried leave is added to the food near the end of preparation, due to the presence of volatile oils. Prefers dry alkaline soil in full sun. Sow seeds in trays in a greenhouse or cold frame in spring, potted into 3in (7.5cm) pots when large enough to handle, and planted out when well established. Alternatively, take softwood cuttings in summer as flowering starts. Leaves are harvested just prior to flowers in mid- to late summer, in the afternoon of a warm day, removed from stems and used fresh or dried. Spring for cooking are gathered as needed throughout the growing period.